Teen Vogue kicked off the week spreading the word about students’ rights in preparation for National School Walkout, a protest planned by students across the country to honor and support the victims and survivors of the February shooting at Marjory Stoneman Douglas High that left 17 people dead and brought rise to new voice in youth activism. Teen Vogue also published the comic in full to help spread the word far and wide to as many students as possible! The Washington Post took the time to interview Kai Texel about how her own experiences shaped the comic. Texel, who graduated from High Point Regional High School in Sussex County in 2012, is now a cartoonist, and she used those lockdown memories to help fuel her new webcomic, “Be Heard!,” in which two friends discuss how best to speak out. The day of National School Walkout, the nation saw students walk out en masse, “to protest the gun violence epidemic that has plagued American schools for years.” Entertainment Weekly published the comic in full and their support increased the reach of the resource when it was needed most. The Advocate is the only publication dedicated to the LGBTQIA Movement that began before the Stonewall Riots that is still in print today! So their championing of the Be Heard! comic, and its commitment to protest rights was immensely appreciated. When Texel was asked to create a comic for students about upcoming protests she was beyond thrilled. 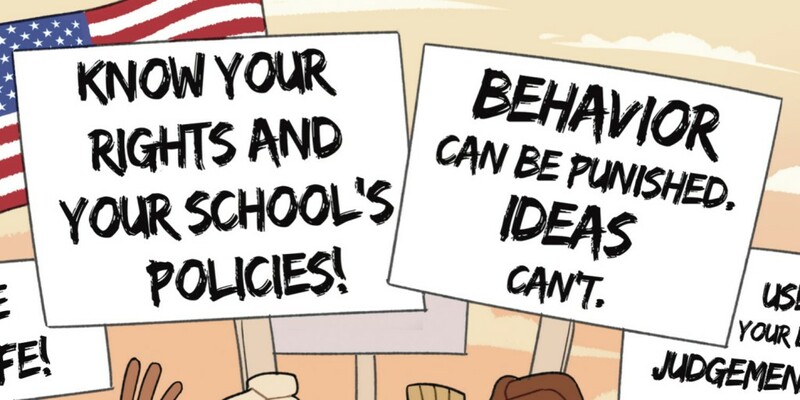 “The comic was made with the intention to help them organize and take the precautionary steps to ensure that they are effectively using their voices. I thought the best way to do this was to make it from the perspective of the students themselves,” Texel says. This Saturday students and adults will gather in D.C. and around the country at March For Our Lives protests. Hopefully, with all the support Be Heard! has found, it will continue to be a resource on March 24th and long beyond, defending those that are actively shaping the national debate! CBLDF and NCAC extend our deepest thanks to David Hyde and everyone at Superfan Promotions for helping us spread the word about #StudentsBeHeard!